Thought I'd post some vids of my unusual tank. Yes, it is overstocked. I bought all these fish as babies when I set up the tank in 2007 and haven't purchased a single fish since. The most unusual part of my tank is the variety of fish which breaks the "rules" of much fish keeping advice. I have tiny fish an inch long hanging boldly with fish 6, 7 even 11 inches long. A few oddballs in there as well. Also, many of the fish are, (in just little over a year), larger than most books say the max size is. Finally, click in the last link for a shot of one of the most amazing eartheater cichlids I have ever seen. Here's a list of fish with some video links at the bottom. Many more on my youtube page. An odd mix as you say! How big is the tank? You sure do have some nice fish there Did you get all the fish when they were young? KittyKat wrote: An odd mix as you say! How big is the tank? You sure do have some nice fish there Did you get all the fish when they were young? Thank you. It's an 85 gallon and yes, I got all the fish very small when I set up the aquarium in 2007. I haven't purchased any fish since but because of the low mortality rate, my tank is a bit crowded. But I know that reaching the 2 year mark, some of the fish will die off and will make room for others. That is small! I am surprised that so many of the fish have grown so big as I have found in the past that when such large fish are kept in a (proportionately) small aquarium, they rarely reach their full size potential. I myself have never really experimented with keeping large fish in small tanks, but I would be interested to know what your plans are for the future as a few of the fish you have really can get quite large.. for example the Black Bar Myleus (M. schomburgki) would in the wild grow to at least 40-45cm (16-18 inches). That goes a long way to explaining why the large ones don't eat the small ones! I too have found that when raised together, the fish are usually less inclined to eat each other. KittyKat wrote: That is small! I am surprised that so many of the fish have grown so big as I have found in the past that when such large fish are kept in a (proportionately) small aquarium, they rarely reach their full size potential. 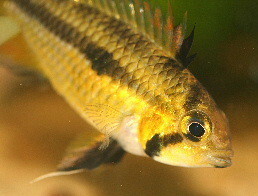 I myself have never really experimented with keeping large fish in small tanks, but I would be interested to know what your plans are for the future as a few of the fish you have really can get quite large.. for example the Black Bar Myleus (M. schomburgki) would in the wild grow to at least 40-45cm (16-18 inches). [quote=whynitica]I got all the fish very small when I set up the aquarium in 2007. Black-bars will not grow any where close to that large in an aquarium. In fact, I think that number may be even a little inflated for the wild. I've only seen one website that says they're capable of reaching 40 cm (most say 15-25cm, which is too small). I know Baltimore aquarium has some pretty sizable ones, maybe 12-14 inches. In an aquarium, (even a large one) these fish rarely reach 8 inches. Of all this fish I've ever owned, I've researched these guys more than any. An 85 gallon is big enough (my tank is 14 inches wide). The only other fish of concern is the hifin, which is easily relocated to a pond, seeing that I live in sunny California. Thanks for the comment. If you have info on the black-bars, please submit it to me.